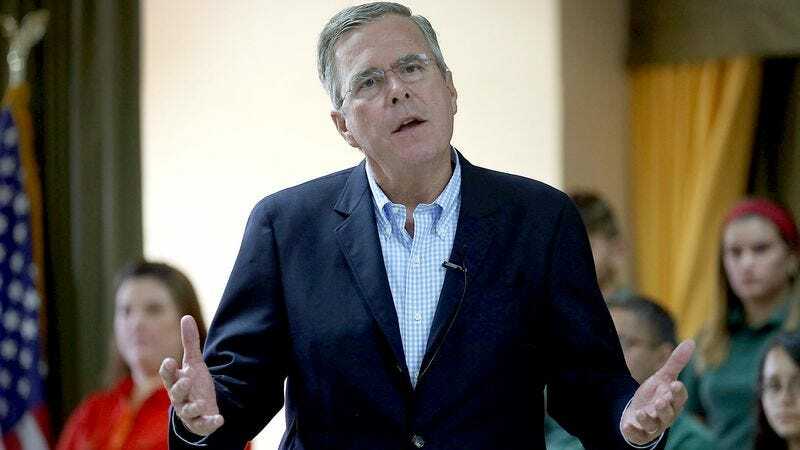 MASON CITY, IA—Having carefully rehearsed their soundbites and readied their bus for one final month on the road, Jeb Bush’s presidential campaign reportedly kicked off a three-state farewell tour with a town hall meeting Monday before a gathered crowd of dozens. “We wanted to show moderate Republicans how much we’ve appreciated all the support we’ve had throughout this election season, so we put together a busy schedule of stump speeches and meet-and-greets to bid our goodbyes,” said Bush campaign manager Danny Diaz, who noted that the candidate would treat audiences to his most popular talking points and attacks on his rivals during the four-week sendoff that will take him to select cities in Iowa, New Hampshire, and South Carolina. “We just really want to enjoy these final few days together as a campaign and take the opportunity to personally thank the many donors and political strategists who’ve made this whole thing possible. Then, I guess, we’ll all share one final pat on the back, give our endorsement to Marco Rubio, and head our separate ways.” Diaz noted, however, that given Bush’s compromised condition, there was a chance they might have to end the tour early and cancel their final few dates in South Carolina.